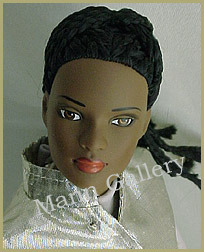 Robert Tonner Designer Fashion Dolls at Mann Gallery! In a fashion shoot for Tyler Wentworth® sportswear triumphs, Esmé sported an elaborate braided coiffure while wearing this Wentworth classic. For comfort and style en route, she slips on a jersey mock neck and leggings with her taupe boots. The metallic fabric of her drawstring vest and her quilted ¾ coat add a touch of high style to Tyler’s functional design. Urban Sport is also available as an outfit only. Jet-black hair, micro braids; brown eyes; bending arms. Doll complete with outfit $79.00 Shipping and Insurance $7.